Information submitted in a nomination letter to the U.S. National Ski Hall of Fame by Cuck Rowan and Herb Lloyd. 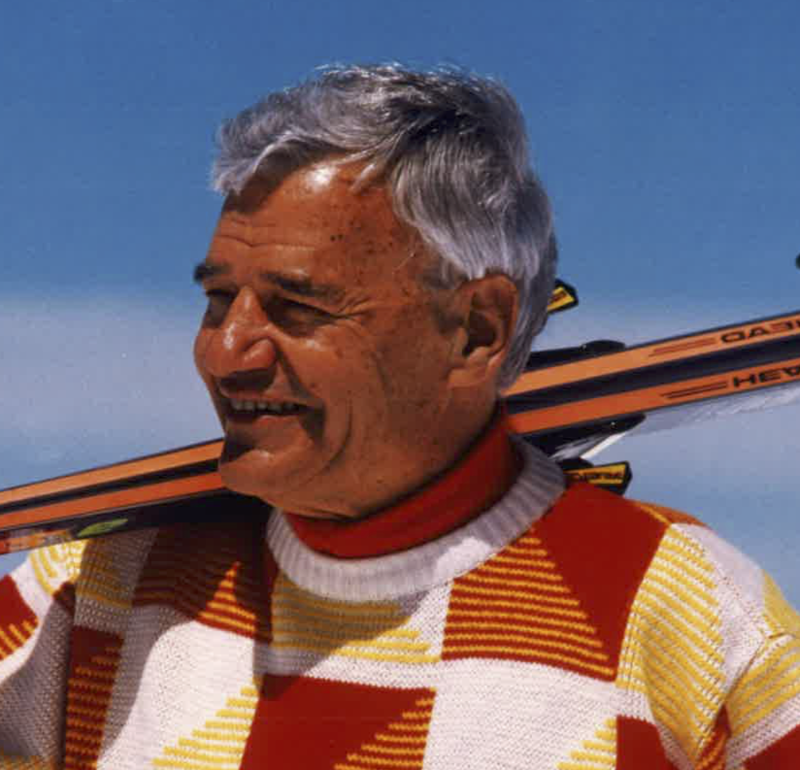 Junior Bounous contributed greatly to the growth and development of skiing in the United States. He built a solid reputation as an innovative and progressive teacher of skiing with the instinctive quality of helping people realize the joy and excitement of skiing. In 1948, Junior became one of the first certified ski instructors in Utah, joining forces with Alf Engen in Alta. The philosophy of the Alta Ski School was to increase the joy and safety of skiing, differing from the regimented teaching programs then in existence. From this philosophy came the American Ski Teaching System. In 1958, Junior became the ski school director at Sugar Bowl in California. He was one of the earliest American-born ski school directors in this country. Junior’s skill in training instructors to implement the American Ski Teaching System was a major factor in his being hired by Sugar Bowl. Remaining there for eight years, Junior formulated and refined his teaching skills and methods. In 1966, he returned to Utah to become ski school director and part owner of the Timp Haven/Sundance Ski Area. While there, he directed a country-wide ski training program involving eight city recreation organizations and eight city high schools. He remained as director until his move to Snowbird in 1970. Junior was hired to do the layout of ski runs at Snowbird and became the ski school director, remaining there until 1991. Junior then accepted the position of Director of Skiing in Snowbird. This enabled him to become more involved with marketing and special promotions. He devoted his time to developing special training and marketing programs aimed at the rapidly growing senior citizen element. Two popular classes for seniors are Junior’s Seniors and Silver Wings. Junior’s love of skiing has led to his involvement in different national organizations. He joined the Ski Patrol (1944-1958), obtained the National Forest Service Ski Instructor Certification in 1948, served as a member of the NSA Certification Committee during the years of 1952 and 1956-1958, was a member of the board of directors of the FWSIA (Far West Ski Instructor’s Association) in 1960 and was a founding member of the PSIA (Professional Ski Instructors of America) in 1961. Bounous was a contributing writer and consultant to the ski media for more than 30 years and loved to participate in any media that publicized his sport. His reputation among his peers is outstanding, a testament to his contributions to the sport of skiing. Junior’s contributions to skiing have been recognized with many awards. Some of his awards include the “Sports Writers of California” award, the Alta “Diamond” award, the Alta Hall of Fame (1993) and the “PSIA Distinguished Service” award. Junior Bounous was elected to the U.S. National Ski Hall of Fame in 1996. If you notice any errors or inconsistencies in Junior Bounous's bio, click here to let us know.